Host China has invited five non-member countries to the annual BRICS leadership Summit that begins this Sunday. “This time, China has adopted a global approach and invited five countries from various parts of the world,” Russian Ambassador to China Andrei Denisov was quoted by Russian agency Tass. UNASUR and the Community of Latin American and Caribbean States (CELAC) leaders were invited to attend the 6th BRICS Summit in Brazil. The African Union had participated in the 2013 Durban BRICS Summit. Leaders of Guinea, Mexico, Thailand and Tajikistan will attend the BRICS Summit this year. 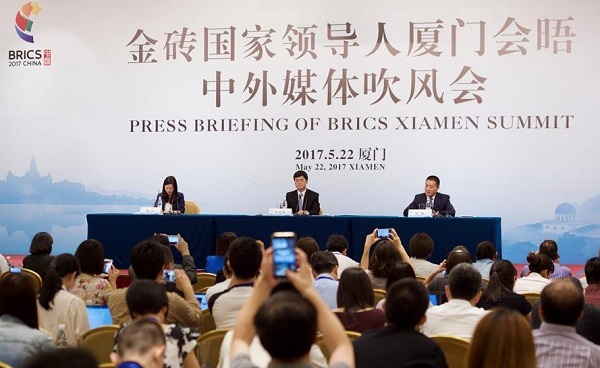 The 9th annual BRICS summit will take place in China’s Xiamen on September 3-5. The bloc has created a $100 billion development bank and a $100 billion emergency fund. Border tensions between BRICS members, China and India, will not be discussed by the bloc, although leaders of the two countries are expected to hold bilateral talks on the sidelines of the summit. Intra-BRICS trade ties remained robust for the past year. Earlier last month, Vice Commerce Minister Wang Shouwen said China expects to import over $8 trillion worth of goods in the coming five years, and the other BRICS members are welcome to further tap into the vast Chinese market. China was the largest trading partner for the other four nations last year. Earlier this month, Trade Ministers from Brazil, Russia, India, China and South Africa discussed trade facilitation, economic and technological cooperation, and the multilateral trade system at a two-day annual meeting. At the BRICS meet, Chinese Minister of Commerce Zhong Shan warned against trade favouritism. “Safeguarding the multilateral trade system and rising against protectionism serve the common interests of emerging and developing economies,” Zhong said. The zeal of protectionism pushed forth by Donald Trump’s electoral win has been a much-discussed topic at global economic summits including the G20 earlier this year. The BRICS Summit in Xiamen will also discuss the fight against protectionism and the state of the global economic recovery.